4-Word Review: TV repairman gets rich. Lester March (Jerry Lewis) is a dimwitted TV repairman who has a penchant for reading detective magazines and desires to become a private eye. When Pete Flint (Jesse White) who is an actual detective comes to his shop one day with a broken TV set Lester uses the opportunity to ‘audition’ himself as Pete’s assistant on his next case. Pete decides to try him out by putting him on a case involving a rich family whose heir to their fortune is missing yet when Lester starts to investigate he realizes it may be himself that they are looking for. The script by John Fenton Murray comes off like it was written in one day and could’ve possibly been done by a 10-year-old in a matter of an hour. The plot is lame and flimsy, the humor excessively silly and the movie offers nothing new or creative. The running gag involving the Jack Weston character and his many attempts at trying to kill Lester is nothing more than a live action, subpar version of the Wiley E. Coyote/Road Runner formula. How much one enjoys this film relies heavily on how much they can tolerate Lewis. To some extent he is mercifully more restrained here and not as obnoxious as usual, but there are still several scenes that get unnecessarily extended just so he can play up a gag that has nothing to do with the plot and isn’t funny. The biggest issue I have with the character is that he’s too unrealistically and painfully stupid. It’s one thing to be a slightly dimwitted schmuck, but this guy speaks and acts like he has a severe mental defect and needs clinical help. Mae Questel, who was best known as the voice of cartoon character Betty Boop, is far funnier and without trying half as hard. The scene where she gets into a tight jumpsuit despite being quite overweight and elderly and then tries to do some exercises will certainly elicit a few genuine chuckles from just about anybody and the only real funny part in the movie. Weston isn’t too bad as the nemesis especially the scene involving his attempts to run Lester over with a car. The climactic sequence involves Lester being chased around by robotic lawn mowers, which offers a slight diversion, but the rest of the film is forgettable and subpar even for Jerry Lewis standards. 4-Word Review: Saleslady saves family farm. 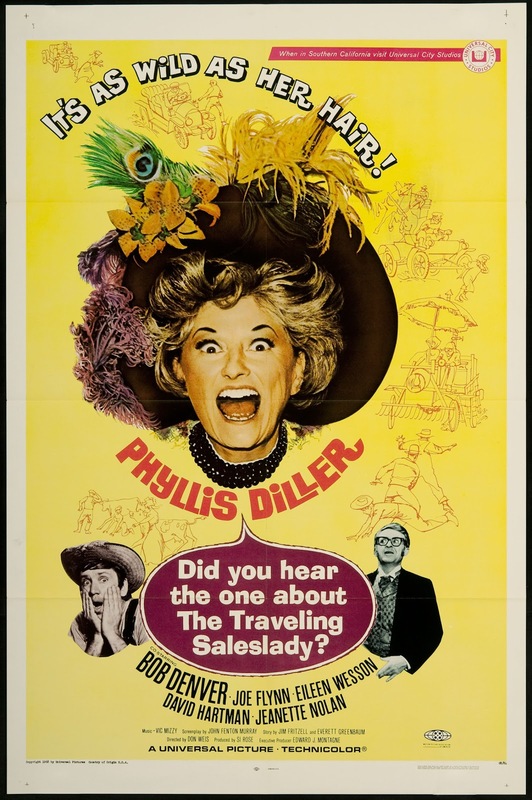 Agatha (Phyllis Diller) is a traveling saleswoman who arrives in a small Missouri town in the summer of 1910 trying to sell a piano that can play by itself. During a demonstration of it one of the townspeople, the kindly, but inept Bertram (Bob Denver) accidently destroys it. Agatha now finds herself stuck with a piano she can’t sell and nowhere to go. Bertram allows her to stay at his family farm, which is at risk of being foreclosed by the town’s greedy banker Hubert Shelton (Joe Flynn). Bertram and Agatha come up with a way to save the farm by winning an automobile race in a wild vehicle created by Bertram using parts from the destroyed piano. It seems hard to believe in retrospect that eccentric comedian Diller was ever considered star making material, but she did 8 films during the 60’s with 4 of them centered on her flamboyant persona. All of them tanked both critically and at the box office with this one being the last of them. I imagine trying to come up with a scenario using Diller as the centerpiece would be no easy task, but this screenplay penned by John Fenton Murray is too broadly written to be even remotely interesting and seemed already badly dated even for its era. The humor is locked in a kiddie level with a plot that is excessively simplistic and won’t intrigue anyone over the age of 6. Diller pretty much just plays herself, which would be alright if some her jokes and lines were actually funny, but none of them are. The reoccurring gags centered on her whacky outfits, ugly appearance and horses that go crazy the second she reveals any part of her legs gets old fast. Denver’s character is nothing more than an extension of Gilligan and Flynn is pretty much being the same character he was in ‘McHale’s Navy’. The film is watchable if you come into it with extremely low expectations, but that is not saying much. None of the gags work and the town’s set was clearly filmed inside Universal’s studio lot, which looks phony and annoying. Denver’s milking machine invention, which can milk 6 cows at once, has potential, but when the cows escape and rampage the entire town it becomes forced humor at its worst, which goes likewise for the climatic and silly car race.